While cooling his heels in Brooklyn, Saakashvili fumed over charges leveled against him by prosecutors in his home country of Georgia. According to the Times profile, Saakashvili was accused of “using public money to pay for, among other things, hotel expenses for a personal stylist, hotel and travel for two fashion models, Botox injections and hair removal, the rental of a yacht in Italy and the purchase of artwork by the London artist Meredith Ostrom, who makes imprints on canvases with her naked, painted body. Yet, as much fun as some of these well-connected politicians and bureaucrats may be having in Kiev, the plight of the average Ukrainian continues to worsen as “free-market” reforms demanded by the International Monetary Fund take hold. Those “reforms” have included slashing old-age pensions, removing worker protections, and hiking the price of heating fuel. Now, the latest “democratic” reform is to appoint a neocon politician on the run from his own country’s criminal justice system to govern what is likely to be a hostile population of ethnic Russians in Odessa. Overseeing that tense city now is an unelected ex-Georgian neocon politician who is facing charges in his homeland for human rights abuses and misuse of government funds — more “democracy promotion” in the tragic land of Ukraine. It’s hard to believe that the US and its NATO allies are so single minded in their program of surrounding Russia with hostile states. The road to a third and devastating world war fought with the full panoply of nuclear weapons is frightfully clear. Perhaps, only the good offices of the United Nations will be able to follow the narrow road to peace. Let’s go guys. Time for peace in this world; through the one institution that represents the entire world – the UN. I am from Russia, I live in Russia. Well. There’s no doubt that this tie-eater and criminal together with UkroNazi and USF are going to engage my country into a Big War! I hope everyone heard about blockade of Pridnestrovye (Transnistria) and placing of S300 along border. And so-called OSCE seems has no words about it. It means that this company (listed above) will force Russia to react. It is a simply the repetition of 5-Days War in 2008. Saakashvili and his friends are still walking around because of what they know. They could tell a multitude of stories about networks of patronage and US intelligence agencies; even though these would all implicate themselves. Many observers in Georgia have concluded that these people have to be either protected or killed by foreign intelligence services, and at the moment it is the latter. But they obviously thought they would always be protected in Georgia, until their crimes became too blatant. They were given a nasty shock when Bidzina Ivanishvili, a man with no political track record at all, was parachuted in and proved hugely popular. Using their connections they have found safe haven in Ukraine. But if this latest US scheme goes wrong, who will get the blame? The US? The Ukrainians? Or the foreigners who have been brought into the Ukrainian government with toxic records from elsewhere? Saakashvili and his friends are useful for pursuing the sort of programme the US has introduced in any number of now failed states it has entered to impose its own interests on the local population. But the US and its proxies know that one day they will be found out. Saakashvili is one of those who can point fingers at them already. By using his methods when it suits them, and then making him take a fall if things go wrong, they can turn this around. Saakashvili has got his new position as an indirect reward for the crimes he committed in his old one. For now he can still blame others for these, if forced. But if Ukraine goes the way of other US projects he, the dubious foreigner, will have to take the rap. Then no one will listen to stories from his time in Georgia. More like the epitome of the U.å. EåCEÏŸÏŸ of EVIL in ODEÏŸÏŸA ! Soros wants Ukrainians to get rid of Vladimir Putin, and this requires heavily arming Ukraine. Soros was giving instructions to this regime that he had proudly helped bring into power. But he pretended that doing this would economically benefit Ukraine. *Correction- John McCain got called out for palling around with real Ukranian nazis (not neo-nazis). The Renaissance Foundation, a global consulting network formed by George Soros, had sponsored Kiev’s administrative “headhunting process”. It paid as much as $82,200 to two Prague-based global head hunting firms. Numerous potential employees were members of the Ukrainian community in Canada, the US and the UK. Saakashvili earlier had been offered the post of Vice Prime Minister in the Ukrainian government. Tbilisi, who had issued an arrest warrant for Saakashvili in August 2014, warned the Ukrainian leadership against such a hasty step. David Kereselidze, the Minister of Foreign Affairs of Georgia has emphasized that if the ex-president or someone from his team was appointed to the government of Ukraine, it would negatively affect the bilateral relations between the two states. Saakashvili left Georgia immediately after President Giorgi Margvelashvili’s inauguration in November 2013. He has been facing several serious charges including abuse of power, using excessive force against protesters and murder. Saakashvili stated on June 1, 2015 that he accepted Ukrainian citizenship to avoid “guaranteed imprisonment” in Georgia. The Ministry of Foreign Affairs of Georgia has stated that the Saakashvili’s new appointment would not have a negative impact on the relations between Georgia and Ukraine. In the early 1990s, Saakashvili was friends with Poroshenko at the Taras Shevchenko National University of Kyiv. Like Poroshenko, Saakashvili has American fingerprints all over him. 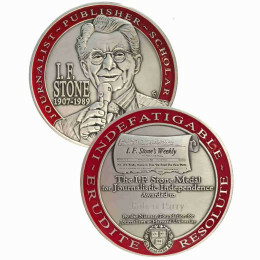 He received a fellowship from the United States State Department to study law at Columbia and George Washington. He interned in the New York law firm of Patterson Belknap Webb & Tyler in 1995, immediately prior to launching his now notorious political career in Georgia. It is very interesting, Abe, that the Soros foundation is employing American & Canadian Ukrainians, considering that a large number of the OUN-B skipped war crimes trials and emigrated across the Atlantic following WWII, some to be used for CIA intelligence (the OUN-B: extreme nationalist Russophobes who collaborated with Hitler & aligned themselves with Bandera.) Erik Zeuse has some interesting articles in Global Research & elsewhere that discuss the children of this generation- the “Bandera babies”, as being raised with the fascist and neo-nazi ideals of their parents (ideals that faded in Ukraine) . Also, these emigres tended not to be passive. They were very well connected with government & proved to be powerful boosters of the Republucan Party. John McCaine ended up getting in trouble for being a member of one of their groups which was infused with open neo-nazis….How the pieces come together… I have noticed also that the social media comment boards are often flooded with propagandizes obviously of Ukrsinian descent & living in North America… I’d be real interested to know what kind of role these emigres have been playing in all that has happened in Ukraine . . … . Very interesting, indeed. 10 years ago, I would call this “conspiracy theories”, but not now. I am a Russian, but have been living in Norway for last 20 years. Part of my early childhood was spent in Crimea (then Ukraine). I remember, as a child in 1992 or 1993 being shown a brand new Ukrainian history textbook meant for 8th or 9th grade, which was supposedly written and printed in Canada (!) How I would like to see this book today… The book was full of quasi-historic nonsense about how all Russian history was fabricated, and Ukraine existed since the 8th Century, etc. According to the book, Russians did not really exist as a people, and those who called themselves Russians were really Tartars and Mongolians. (Considering the medieval history of Mongolian invasions, “Mongolian” or “Tartar” would sollicit very negative, racist feelings among the children reading the book). And, of course, cartoon-villain style description of everything from the Soviet period… Add to this the glorification of Bandera, and you’ve have a perfect starting point for demonizing “the others” – the Russian minority. Already in the 1990ies! Many members of the Ukrainian diaspora are children of soldiers who fought with the Germans, but were sent to the Britain, Canada and the United States because their virulent anti-Russian mentality was deemed worthy of preservation. The Ukrainians were influenced by German propaganda that portrayed the Soviet enemy in the most dehumanized terms, depicting the Red Army as a force of Slavic Untermensch (sub-humans) and “Asiatic” savages engaging in “barbaric Asiatic fighting methods” commanded by evil Jewish commissars to whom German troops were to grant no mercy. The last statement is a reference to the “preventive war” that Barbarossa was alleged to be. As a result of this sort of propaganda, the majority of the German officers and soldiers, as well as their non-German allies, tended to regard the war in Nazi terms, seeing their Soviet opponents as so much sub-human trash deserving to be trampled upon. As a result of these views, the majority of the German Army worked enthusiastically with the SS in murdering Jews in the Soviet Union. The Wehrmacht did not just obey Hitler’s criminal orders for Barbarossa because of obedience, but rather because they shared Hitler’s belief that it was necessary for Germany to completely destroy “Judeo-Bolshevism”. The OUN steeped in this sort of propaganda, combining nationalism with the most vile racism. Former president of the Republic of Georgia, Mikheil Saakashvili, will serve as the Fletcher School of Law and Diplomacyâ€™s first Senior Statesman starting this January. The position of Senior Statesman is a new idea, intended to provide students with access to internationally known leaders and practitioners in a variety of fields, Admiral James Stavridis, dean of The Fletcher School said. â€œOur concept is to try to bring each year some important international political figure to be affiliated with The Fletcher School,â€ he said. Saakashvili, who served as president for two terms between 2004 and 2013, founded Georgiaâ€™s United National Movement Party and led the Rose Revolution, which forced the resignation of the Republic of Georgiaâ€™s president at the time. Saakashvili will not be in residence at Fletcher full-time, but is expected to visit on three or four occasions during both semesters of his one-year appointment. Saakashvili is excited to interact with students at The Fletcher School in both informal and educational settings, he said. After graduating from the Institute of International Relations at the Taras Shevchenko National University of Kyiv, Saakashvili came to the United States to study law, receiving a Master of Laws from Columbia University and taking doctoral-level classes at the George Washington University Law School. In 1995, he received a diploma in Comparative Law of Human Rights from The International Institute of Human Rights in Strasbourg, France. Saakashvili was first elected to the Parliament of Georgia in 1995 and five years later became the countryâ€™s Minister of Justice under President Eduard Shevardnadze, his presidential predecessor. 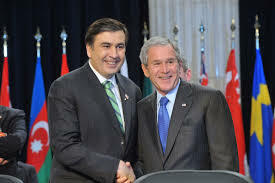 In 2004, after a bloodless revolution, Saakashvili became the youngest national president in Europe and third president of the Republic of Georgia. Stavridis believes that one of Saakashviliâ€™s most important contributions to Georgia was leading the Rose Revolution â€” a 20-day long peaceful protest that ended the previously totalitarian period of Soviet Era leadership. Saakashvili was instrumental in organizing more than 100,000 protesters during the revolution. According to Academic Dean of the Fletcher School Ian Johnstone, Saakashviliâ€™s experiences will be valuable to the students and faculty at Fletcher. Saakashvili chose to join The Fletcher School as Senior Statesman because Fletcher is a prestigious school with many faculty and students who focus on his region of the world, he said. 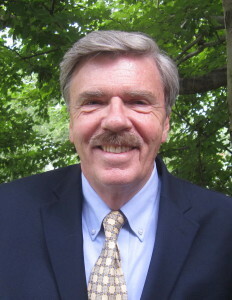 Beyond Fletcherâ€™s connections to his region, the character and intellectual nature of the school also attracted Saakashvili, he said. Johnstone believes Saakashviliâ€™s presence will bring excitement and intellectual stimulation to both Fletcher and Tufts, he said. Stavridis considers both Saakashviliâ€™s practical experience and personal character invaluable, he said. â€œ[Saakashvili] is a very dynamic, intellectual individual who I think will be a great addition to our community at The Fletcher School and at Tufts University,â€ Stavridis said. Saakashvili’s was appointed as first Senior Statesman by retired United States Navy admiral, James G. Stavridis, now the 12th Dean of the Fletcher School of Law and Diplomacy at Tufts University. Stavridis served as the 15th Commander, U.S. European Command (USEUCOM, May 2009 â€“ May 2013) and NATO’s 16th Supreme Allied Commander Europe (SACEUR, June 2009 â€“ May 2013). He is the first Navy officer to have held these positions. He served as a strategic and long range planner on the staffs of the Chief of Naval Operations and the Chairman of the Joint Chiefs of Staff. At the start of the “Global War on Terror”, Stavridis was selected as the director of the Navy Operations Group, Deep Blue, USA. He has also served as the executive assistant to the Secretary of the Navy and the senior military assistant to the United States Secretary of Defense. Stavridis has long advocated the use of “Smart Power,” which he defines as the balance of hard and soft power taken together. He has stressed the need to connect international, inter-agency, and public-private actors, lining all of them with effective strategic communications. Stavridis has frequently appeared on major broadcast and cable television networks to comment on national security and foreign policy matters. There is a common misconception in the West that there is only one war in Ukraine: a war between the anti-Kiev rebels of the East, and the US-backed government in Kiev. While this conflict, with all its attendant geopolitical and strategic implications has stolen the majority of the headlines, there is another war raging in the country â€“ a war to crush all dissent and opposition to the fascist-oligarch consensus. For while in the West many so called analysts and leftists debate whether there is really fascism in Ukraine or whether itâ€™s all just â€œRussian propaganda,â€ a brutal war of political repression is taking place. The authorities and their fascist thug auxiliaries have carried out everything from physical intimidation, to politically motivated arrests, kidnappings, torture, and targeted assassinations. All of this has been done under the auspices of â€œnational unity,â€ the convenient pretext that every oppressive regime from time immemorial has used to justify its actions. Were one to read the Western narrative on Ukraine, one could be forgiven for believing that the countryâ€™s discontent and outrage is restricted solely to the area collectively known as Donbass â€“ the Donetsk and Lugansk Peopleâ€™s Republics as they have declared themselves. Indeed, there is good reason for the media to portray such a distorted picture; it legitimizes the false claim that all Ukraineâ€™s problems are due to Russian meddling and covert militarization. Instead, the reality is that anger and opposition to the US-backed oligarch-fascist coalition government in Kiev is deeply rooted and permeates much of Ukraine. In politically, economically, and culturally important cities such as Kharkov, Dnepropetrovsk, and Kherson, ghastly forms of political persecution are ongoing. However, nowhere is this repression more apparent than in the Black Sea port city of Odessa. What do Georgian President Mikheil Saakashvili and Ukrainian Prime Minister Arseniy Yatsenyuk have in common? They both have been hosted by the Atlantic Council. The Atlantic Council has released a report co-authored by faux “citizen journalist” Eliot Higgins and his crew of faux “independent investigators” at Bellingcat. Following this chilling logic, the clueless Saakashvili will go the way of Boris Nemtsov and the Heavenly Hundred Heroes of Maidan Square, telegenic martyrs of Washington’s “hybrid war” on Russia. How is it possible that the Neo-Nazis in Kiev getting all that money from IMF $17 billion, EU $ 5 bilion and USA $ 2 billion. It’s certainly NOT their ‘trustworthy’ looks of Yatsenyuk or Turchinov and now Saakashvili another criminal sought for embezzlement and abuse of Power in his native Georgia. The reasons are simple Washington neocons do ‘whatever it takes’ to expand their colonization or geopolitical strategy to establish its power in Russia and use Ukraine as a jumping block. In addition it uses MSM propaganda and people like Soros/McCain/Nuland to demonetize the Russian people and its President Putin. Looking at US aggression in the past 50 years I found more than 40 violations by US military attacking sovereign nations, removing or killing its presidents, murdering civilians, women and children by the hundreds of thousands and causing millions of refugees. In contrast to all civil nations USA is known to use cluster-, dirty/uranium- and napalm bombs in Yugoslavia, in Iraq and now in Syria, Yemen (thru Saudi Arabia) and in Europe in Ukraine. On top of that USA is NO member of UN International Criminal Court in the Hague on the contrary it will free by force ANY US citizen apparently also those criminals in Kiev that murdered 6000 fellow countrymen so far. Washington has become the largest danger in the world of peace loving nations like Russia who lost 25 million people in WW II to defeat the Nazi’s and Europe should be thankfully to the Russians NOT the Americans whose only purpose was to conquer Europe as it new colony. To protect the American interests there are 67,000 US troops in Europe together with 120 nuclear war heads. It’s not that Europeans are afraid of Russia which is part of Europe anyhow, but we’re afraid of Washington to start WW III again in Europe. So USA keep your aggression within your own borders keep on killing young black teenagers, have 2-year old kill their mother or torture people in Guantanamo of have schoolchildren kill their classmates, etc. How come I don’t read these type of atrocities in Russia. The answer is simple Russian people are humans and respect their families and their fellow countrymen For the American people an interesting lesson in humanity and peace. It will be interesting to see now what effect this shameful appointment will have on Kolomoisky and also the separatist neighbor Transnistria. Saakashvili can always be counted on for starting provocation. May god grant NATO the vision to recognize this criminal, and realize he will destroy them. 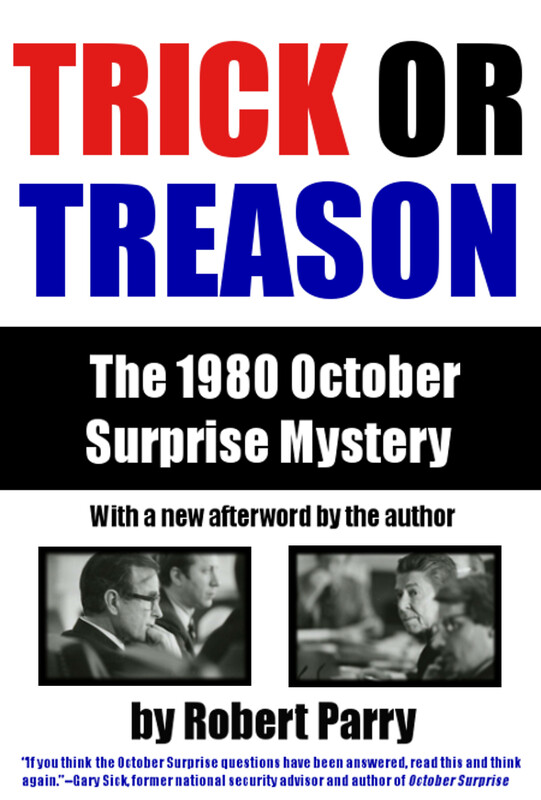 It does seem more and more people are realizing that truthful information concerning anything important or controversial is generally absent from US government reports and those of their partners in deception, the mainstream mass-media networks. Thanks Mr. Parry for all do here! You can see a video of Saakashvili chewing his tie during an interview in 2008. …ask yourself the following question: what are Saakashviliâ€™s credentials? It is pretty obvious that his only â€œqualificationâ€ is his rabid hatred for Russia and Russians and his willingness to execute any US order. I read this essay yesterday at the Saker site. The blogger’s opinion is that this is a new initiative to start a war with Russia. Raise all kinds of hell in Odessa, and if that doesn’t work, start an attack on the tiny enclave of Transnistria on the west edge of the Ukraine. He says that unlike the situation in East Ukraine where Russia holds all the high cards, in the West the US is the one which is setting pretty. There are no good option for Russia right now and all Russia can do is to work as fast as possible to achieve regime change in Kiev. If the US foreign policy towards the Ukraine suffers a crushing blow, Uncle Sam will probably have little stamina left to engage in yet another major effort in Transnistria, especially if the Ukraine finally slips out of the USAâ€™s grip. But until then the TMR is in a very bad situation indeed, and time is not on its side. If he is right, the neocons may yet get their European war. Weaken the ‘Euros’ and the Russians at the same time – what’s not to like for the Empire? On May 2, 2014, neo-Nazi street fighters set fire to Odessaâ€™s Trade Union Building and burned alive dozens of ethnic Russians who had taken refuge there. “However, tensions in the strategic port remain high after clashes between pro- and anti-government protesters on 2 May 2014 left more than 40 people dead. Above photo actually represents troops of the 20th Waffen Grenadier Division of the SS (1st Estonian). Numerous non-German Waffen SS units (including soldiers from Ukraine, Latvia, Norway, Denmark, the Netherlands and Belgium) fought on the German side against the advancing Soviets in 1944. The original 20th century military campaign later became known as the “Battle of the European SS”. in the 21st century. They just need to recruit a few more Nazis.